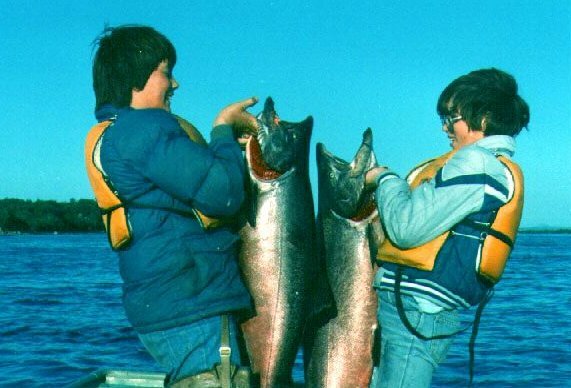 Sometime in the early 80's I had the good fortune to spend the summer at King Salmon. On one particular day I fished with two of Tom Flynn's kids and we had an unbelievable afternoon on the water. These boys ages 10 and 12 were very good fishermen, however the kings that day were as heavy as the kids. Using but 17 pound line in two hours they hooked up with something like 15 big kings and finally we managed to land 6 of them. There was such a competition between them they would not help each other when one of them had one on and most of the time they each had hooked one at the same time. I was kept busy just running the boat, landing the fish, and mostly fixing the broken tackle. Every king that day was in the 35 to 50 pound range. Pictured are the two largest at 51 and 53 pounds.